******Back on Market****** Would you like to see this awesome place or get more info? Call/text Melinda 541-661-0691 or 800-360-3714 Best Business Opportunity - virtually NO competition in a 40 mile radius! Are you ready for some Adventure? Come on, why not Live, Work and Play in a Fantastic, Magical environment? Gorgeous setting in the forest on 6.68 acres right next to Patrick Creek. Enjoy life, clean air, the great environment, fishing, hiking and make a great living at the same time. This amazingly low price includes a 16 room lodge, large pool, a vacation rental house and a separate personal residence. Also includes the Restaurant, fabulous Bar, Liquor License and furnishing of the buildings. There is a large deck overlooking the Creek, that could accommodate a beautiful wedding, corporate event or Church gathering. Let the adventurous spirit awaken in you. Own your own business, be your own boss, and make a great money at the same time! 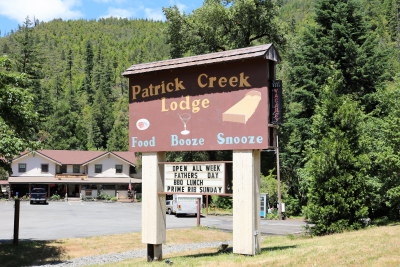 Patrick Creek Lodge has excellent Highway visibility, a loyal clientele and it is connected to a popular Campground via lighted & concreted walkway. This easy access means even more clients. There is so much more to this business & property, do not hesitate to give us a call!